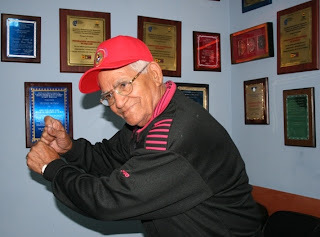 Pompeyo "Yo-Yo" Davalillo was born in the oil producing town of Cabimas, Venezuela 83 years ago today. He was 8 years old when his brother, Vic, was born in the more agricultural and picturesque Churuguara. Vic Davalillo would go on to play 16 seasons, with 6 teams in the Big Leagues. 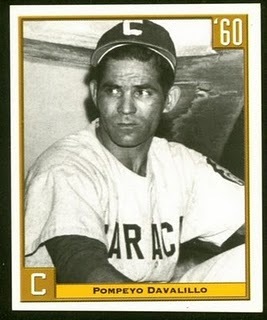 Pompeyo Davalillo was called up on August 1st, 1953 by the Washington Senators, spent about a month with the team, and that would be his only time in the Major Leagues. In his first plate appearance, he pinch hit to lead off the 9th inning, but struck out as the White Sox's Billy Pierce was on his way to a 2-hit shutout. When Pompeyo got his first start the next day, he went a little gangbusters; in his first three starts, he went 3-for-5, 2-for-4, and 2-for-5. He hit his only extra base hit and drew his only walk of the season in his third start, equal to a .583/.615/.667 triple-slash line. 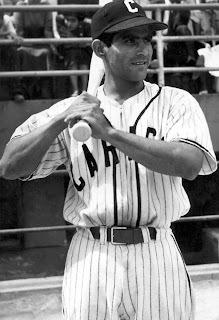 He'd finish with a season, and career, .293 batting average, but leg injuries he suffered in the Winter Leagues, and his lack of power and patience, left his career to peak on the dusty diamonds of Triple-A and his homeland of Venezuala. Pompeyo Davalillo became a manager in Venezuela and Mexico after retiring as a player at 36. He even was able to manage his brother Vic during the Winter in the late 70's. Vic was a member of the Dodgers at the time, therefore managed by Tommy Lasorda in the Summers. Today, the Davalillo family roots for Pompeyo's grandson, Marco Davalillo Jr, who did very well the last couple of years with the Venuezuelan League Phillies. He's just 20 years old, and I think* he just got signed by the Quintana Roo Tigers, of the Mexican Leagues. I probably should have written this in Spanish. Oy.